I visited Petra, near Wadi Rum in south-western Jordan. It's a fantastic set of ruins, about 2000 years old. The current name comes from the Greek, Πέτρα, meaning stone. 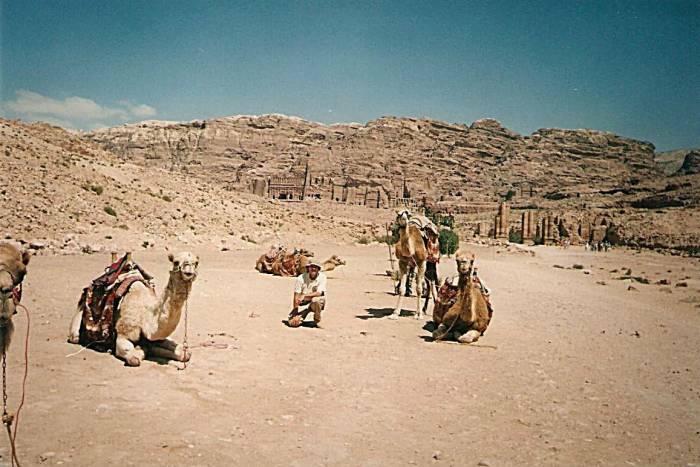 I was visiting Jordan on a trip from Cairo to İstanbul overland, and I had just come north from Dahab. Yes, Petra is the storage place of the Holy Grail, or so we're led to believe. 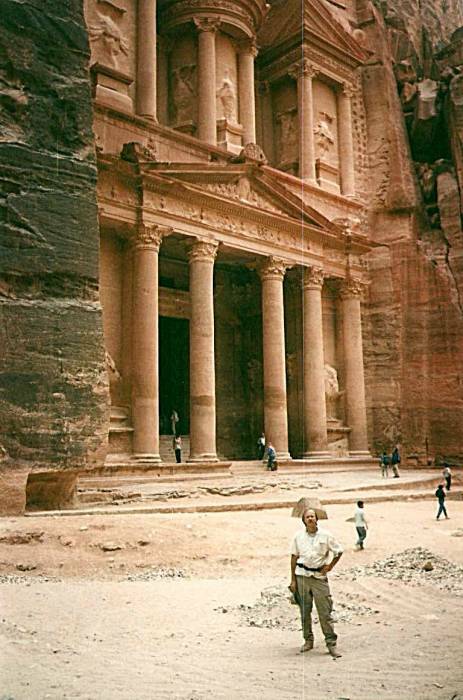 Here you see me standing in front of al Khazneh, or The Treasury, the iconic structure in Petra. There seems to have been some settlements here starting in the 18th dynasty of Egypt, in 1550-1292 BC, with some sort of religious sanctuary established. But things didn't really take off until the Nabataeans arrived. The Nabataeans moved into the area from western Arabia around 700 BC and began carving all sorts of buildings into the soft red sandstone wadis. 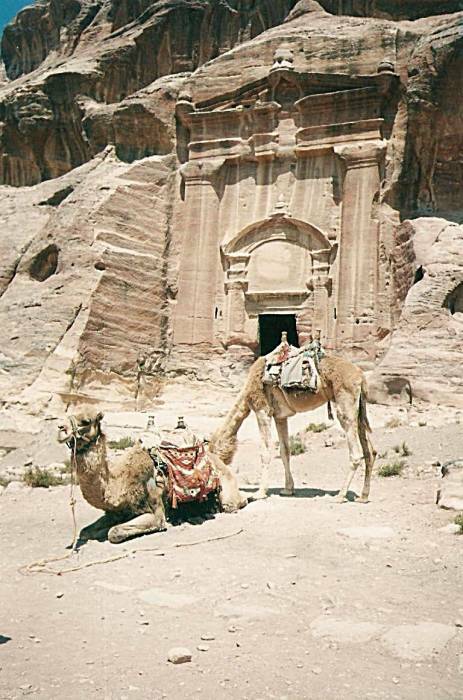 Pliny the Elder and other early historians describe Petra as the Nabataean capital and the central hub of their caravan trade routes. The main commercial routes ran from here west to Gaza and the Mediterranean coast, south to Aqaba and the Red Sea, north to Damascus, and east across the desert to the Persian Gulf coast and beyond that to Persia itself. 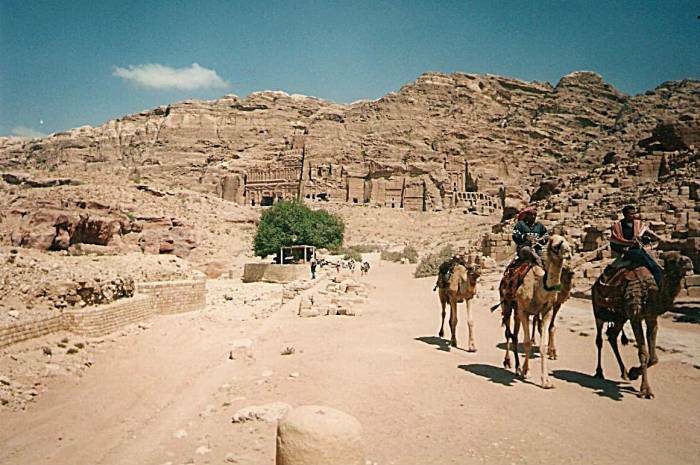 The Nabataeans controlled strings of oases along these routes, where they practiced some intensive agriculture in the small areas centered on the oases. The Nabataeans worshiped the early Arabs' gods and goddesses. Dushara was the main male god, accompanied by his female trinity of Al-'Uzzá, Allāt and Manāt. Some of the more prominent Nabataean kings were deified, including Obodas I. Their monuments to their deities were "god blocks", where they cut away an entire hilltop or rock face to leave only a rectangular block. 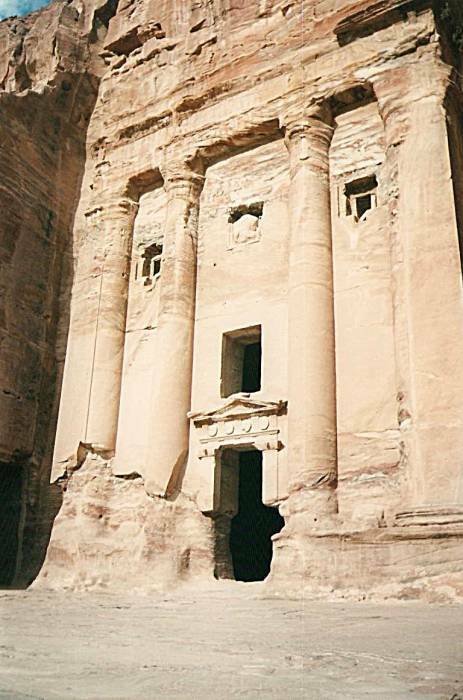 Dushara's sanctuary at Petra is a large temple with a large cubical stone as its centerpiece. The cult of Al-'Uzzá held sacred a stone cube at aț-Țā'if, near Mecca. The influence from Greek and Roman cultures eventually led them to more anthropomorphic representations of their gods. Al-'Uzzá was assimilated with aspects of the Greek Tyche and Aphrodite and the Egyptian Isis. 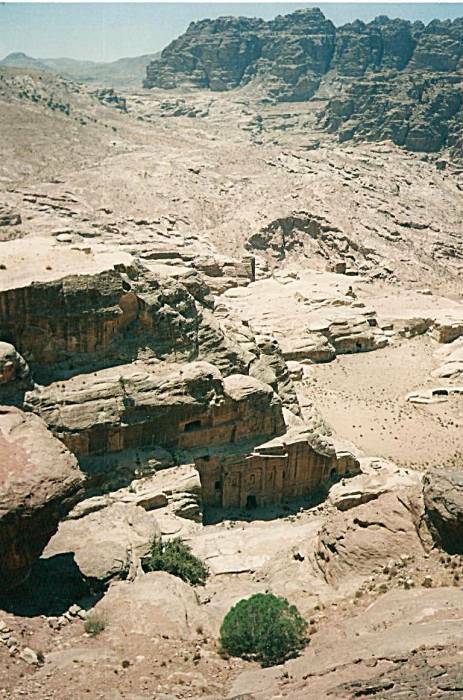 A few inscriptions, mostly graffiti and inscriptions of names and greetings, have been found throughout the Nabataean area, but there has been no record of any literature and the Nabataean temples contain no inscriptions. Some of the limited inscriptions found at Petra have been interpreted to associate Al-'Uzzá with the planet Venus. Their language was a western dialect of Aramaic. It eventually was increasingly influenced by Arabic to the point that the people's language shifted gradually into Arabic and the Aramaic-based Nabataean script was the forerunner of Arabic script. Over her [an Arab] built a house called Buss in which the people used to receive oracular communications. The Arabs as well as the Quraysh were wont to name their children "Abdu l-'Uzzá". Furthermore, al-'Uzzá was the greatest idol among the Quraysh. They used to journey to her, offer gifts unto her, and seek her favours through sacrifice. And al-Manāt, the third idol besides. These are some of the Satanic Verses, a small number of pagan verses that traditional Islamic interpretation says were temporarily included in the Qur'an by Muhammed, then later removed. 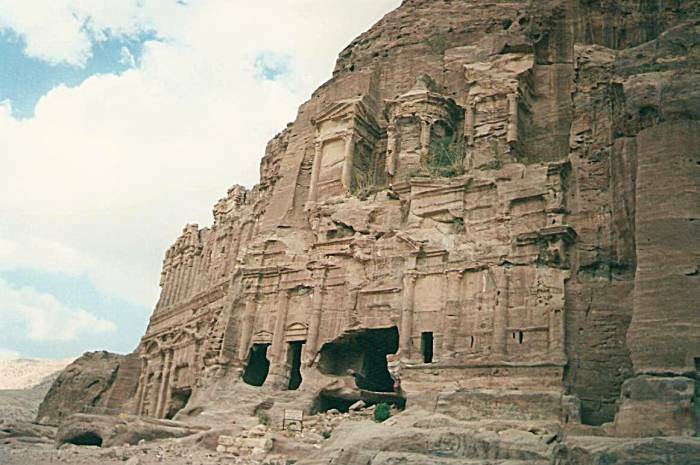 All known presence of al-'Uzzá has been eliminated from South Arabia, but some remains at Petra. After the death of Alexander the Great in Babylon in 323 BC, his empire was divided. The Selucid ruler Antigonus had been given part of Alexander's empire — he rode against the Nabataeans in 312 BC, but was driven back. The Nabataean empire become a major power in the region. Around 1 AD Rome controlled Palestine between the Mediterranean and (for the most part) the Rift Valley. The land east of the Dead Sea and Jordan River was controlled by the Nabataeans, from deep Arabia in the south to Damascus in the north. The empire based at Palmyra in east Syria, eventually under the control of Zenobia, the Warrior Queen, formed a northern buffer against further Nabataean expansion. Rome had influence over the Nabataeans, and uneasy co-existence with the Palmyrans, until Rome's defeat of Zenobia in 271 AD. 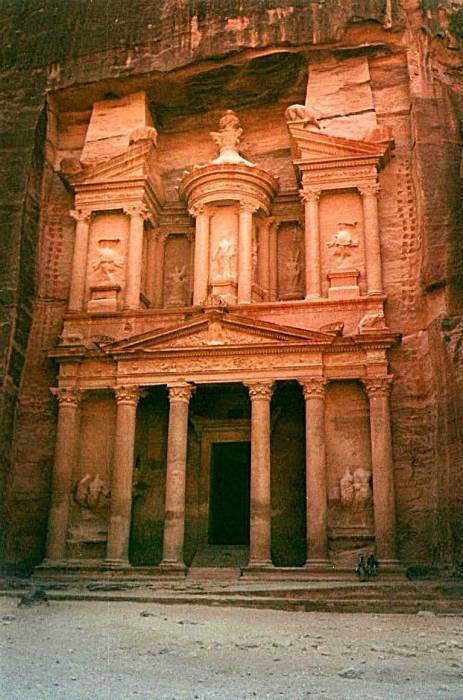 Rome took effective control of Petra in 106 AD and the Nabataeans began a long decline. Christianity arrived, but only as most of the people were leaving. Athanasius mentions an Asterius, bishop of Petra, and at least one of the tombs was used as a church. The Nabataeans changed their written language from Aramaic to Greek by the 3rd century, and those who remained in the area had converted to Christianity by the 5th century. 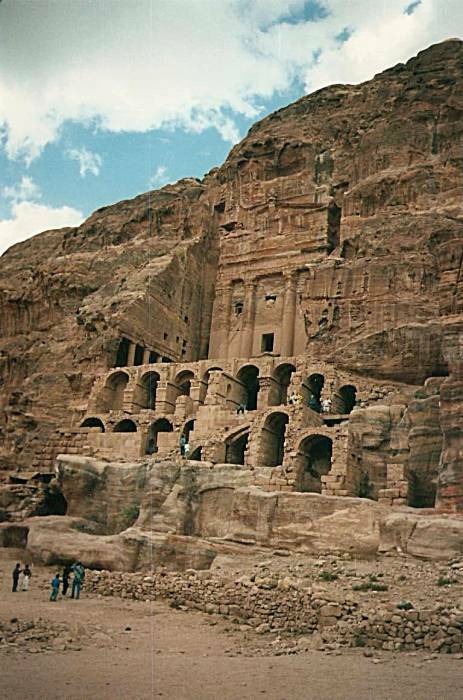 By the Muslim invasion of the 600's Petra was largely abandoned. The Crusaders had a fort there briefly in the 1100's, when Baldwin I of the Kingdom of Jerusalem occupied Petra and formed the second fied of the barony of Al Karak (in the lordship of Oultrejordain), giving the place the title of Château de la Valée de Moyse. The Franks held it until 1189, and at least on paper it is still a titular see of the Roman Catholic Church. 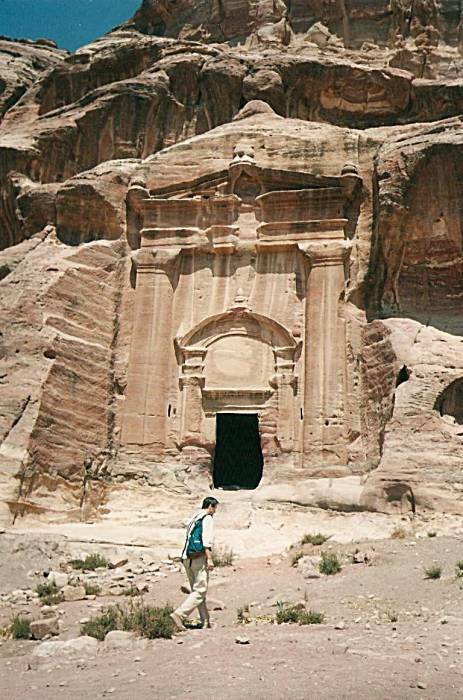 But Petra was otherwise lost and forgotten until the 1800's. Swiss explorer Johann Ludwig Burckhardt re-discovered it in 1812. U.S. Government map of Jordan. 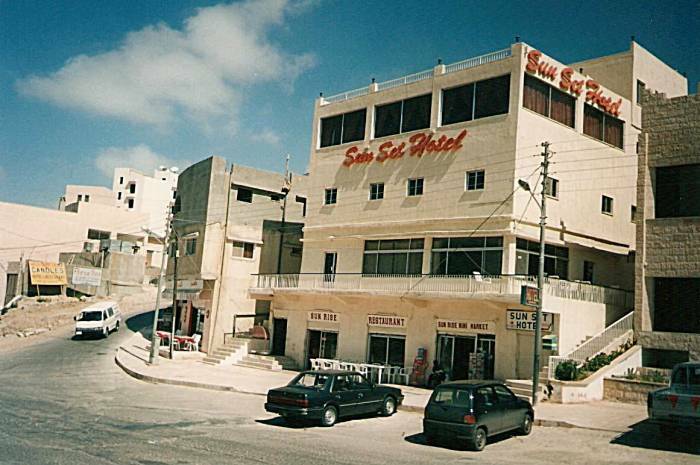 The nearby town is Wadi Musa. That means "Valley of Moses" if you're keeping track of the local terminology. This is from the Arab tradition that this is the spot where Musa (that is, Moses) struck a rock with his staff and water poured out. There is bus service to there from Amman and Aqaba, and minibus service from smaller towns. Wadi Musa is not down in the wadi but up on its rim, spreading down the road to the entrance. You pay an entrance fee and walk into Petra through Bab as-Sīq, or the Gateway to the Sīq, and enter the as-Sīq, a very narrow and tall passage through the rock. The Arabic name means "the Shaft". The Sīq is a natural geologic fault that split open through tectonic movements. The walls of the Sīq are 90-180 meters high and only 3-4 meters apart in places. The lower parts of the walls have been worn smooth by the flow of flood water over the time since it split open. Remnants of several votive niches remain along the lower walls of the Sīq. About a kilometer from the entrance, you see that you are approaching an opening. 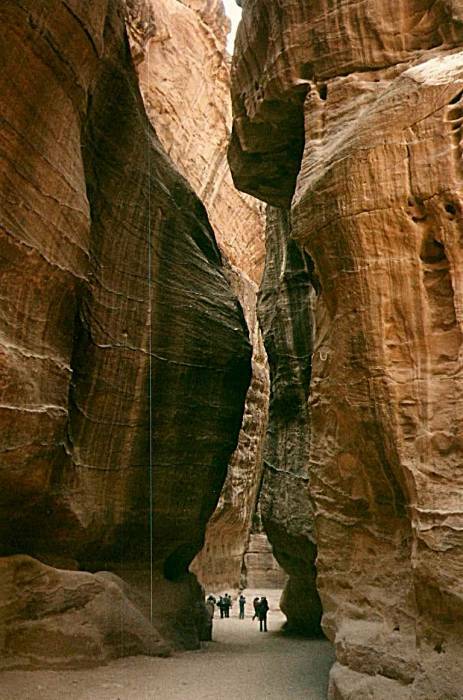 The Sīq opens into a wider canyon, and the Khazneh is carved into its opposite face. It was originally built as a mausoleum and crypt during the reign of Aretas IV Philopatris, King of the Nabataeans from roughly 4 BC to 40 AD. The apostle Paul mentioned in one of his letters and was quoted in a historical narrative that his covert departure from Damascus by being lowered in a basket from a window through the old city wall was done to escape the local ethnarch of King Aretas, an ethnarch being a political leader over a common ethnic group or ethnically homogeneous kingdom. Aretas' daughter Phasaelis married Herod Antipas, also known as Herod the Tetrarch. Herod later planned to divorce Phasaelis to marry his brother's wife Herodias, and in AD 36 Phasaelis fled Herod's capital of Tiberias on the west short of the Sea of Galilee and returned to her father's capital. Aretas invaded Herod's lands and defeated his army, helped by soldiers who changed sides. John the Baptist condemned Herod's plan, leading Herod to arrest and execute John. Meanwhile Herod's territorial disputes led to a disastrous war. His nephew then accused him of conspiracy against the new Roman emperor Galigula, who sent him into exile in Gaul. 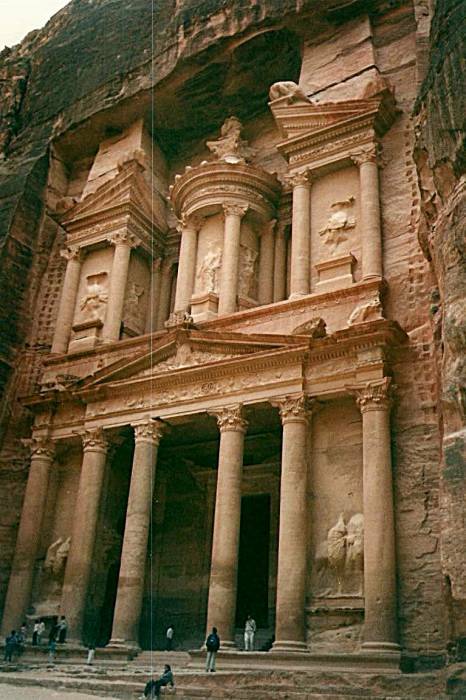 Its name, meaning "The Treasury", is just a guess based on a much later fanciful legend among the local Bedouins, who said that bandits or pirates hid their treasure inside a large stone urn on the upper level. Many rifle bullets hit the urn in hopes of breaking it open, but it is a solid piece of sandstone. Another equally fanciful legend is that the structure was a treasury of the Egyptian Pharoah at the time of Moses. All the detail is created by carving into the soft sandstone. It wasn't constructed by putting blocks together. The decoration, largely eroded away now, is classical Greek. The figures on the upper level are dancing Amazons with double axes, and the twins Castor and Pollux are on either side of the main entryway. 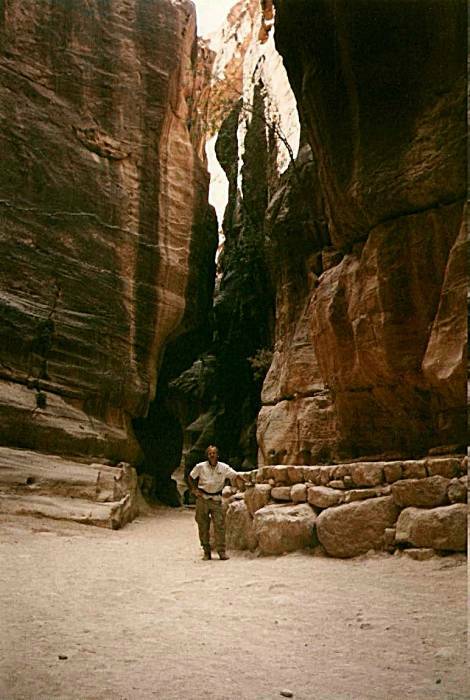 The Khazneh is just the most famous structure in Petra. With the help of Steven Speilberg, of course. There are plenty of other large and dramatic structures, like this one. It was a very large city for its time, so there are many public buildings, private homes, temples, and so on. The sandstone is generally red or pink, hence the "rose-red city half as old as time" reference to Petra in John William Burgon's 1845 sonnet. 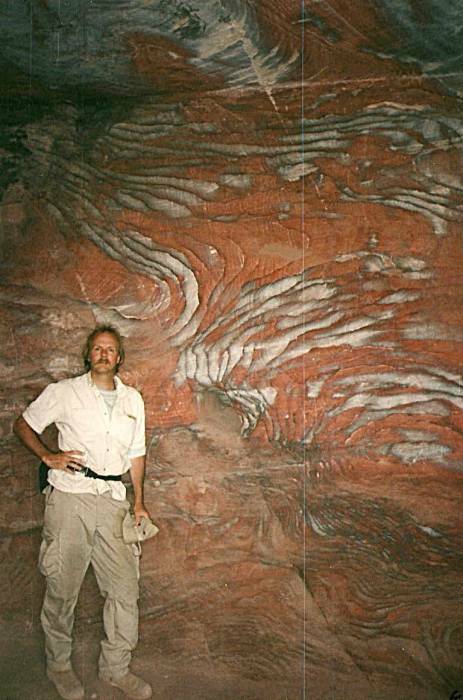 In places it's multi-colored, formed by many layers of sediment of different material. Here you see some of the local transport in front of the Urn Tomb. Local Bedouins lived in the ruins until fairly recently. That brought the expected damage to the site. The Jordanian government built them a new village and moved them out. It was unpopular initially, but now those families have become much more prosperous by working at the park and also taking in visitors for multi-day stays. There is a huge area to explore. Petra can get a lot of visitors. But at least when I was there, it is big enough that have the area pretty much to yourself once you get out of the Sīq and away from the Khazneh. There are plenty of high places to explore. Just don't be setting up altars to Baal, that's frowned on now. 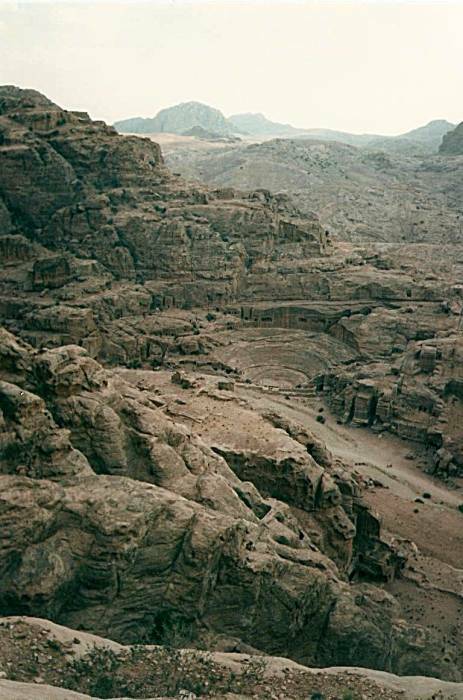 According to local Arab tradition, the peak of Gebel Haroun or Mount Aaron is where Moses' brother Aaron is buried. Back in the 4th century AD, the locals were happy to take pilgrims (in exchange for some baksheesh no doubt) to see a mountaintop shrine to Moses' sister Miriam. However, the locals have lost track of its location. I stayed at the Sun Set Hotel, right outside the gate to the ruins. It's far superior to staying way up on the rim of the wadi in Wadi Musa, as many people do. 10 Dinar (US$ 17) for a double room. And they have a mysterious slogan: "We Just Add A Trask!" Wadi Musa is about 100 kilometers north of the port city of Aqaba, and from there it's another 250 kilometers north to Amman. In Amman, the Cliff Hotel (+962-06-624273) is pretty good. Good luck finding it in Amman's twisting hilly streets. It's right in the downtown area, between King Faisal Street and Basman Street, not too far from the central post office. 5 Dinar for a single room with a fan plus 500 quirsh for a shower (US$ 7.75 total). There are daily buses between Amman and Damascus, Syria, leaving very early in the morning and arriving about mid-day. In Aqaba, the Petra Hotel (+962-03-313746) has plush double rooms for 6 Dinar (US$ 8.50). It's on the main street, just south of the park and the minibus lot, There is allegedly a daily ferry between Aqaba and Nuweiba, Egypt. Ask around for details, and don't expect the schedule to be followed precisely. 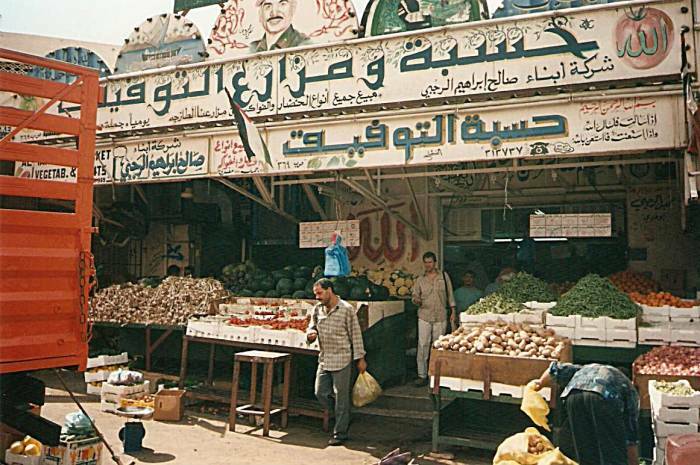 Here is a fruit market in Aqaba. I should have known that the Arabs had good reason for shunning the nameless city, the city told of in strange tales but seen by no living man, yet I defied them and went into the untrodden waste with my camel. I alone have seen it, and that is why no other face bears such hideous lines of fear as mine; why no other man shivers so horribly when the night wind rattles the windows. I continued on from Amman to Damascus. If you like mysterious structures carved into soft stone, check out my pictures of Cappadocia, in Turkey.